This Program of Study at Assignment Help includes not only those courses and clinics that are obviously relevant, but also classes and activities that with less obvious links to law and social change that are potentially critical to building relevant understanding, skills, and strategies. Learning about the past, analyzing relationships among law, society, the economy, and social institutions, dissecting powerful institutions, and developing skills and capacities – including data and policy analysis skills – are all important steps; so is understanding particular problem areas and related legal materials. In order that students may develop a broad understanding of the ways in which law can contribute to social change, the Program is organized in two ways i.e. 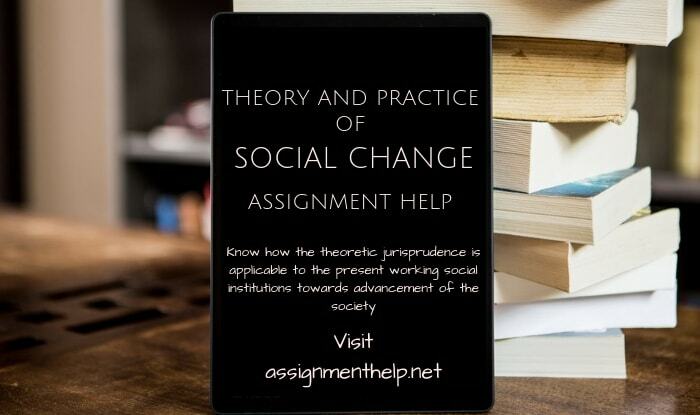 the theory of social change, which deals with the classical studies of Jurisprudence along with the latest developments along with their criticism. The second aspect to focus upon how the theoretic jurisprudence is applicable to the present working social institutions towards advancement of the society.